Farm Namtib i s a privately owned biosphere reserve covering an area of 16 400 hectares situated at the edge of the Namib Desert in the Tiras Mountains. Farming and human activities are adapted to suit the arid climate prevailing in southern Namibia. The fascinating landscape of the farm offers an abundance of breathtaking views and hosts a wealth of fauna and flora. 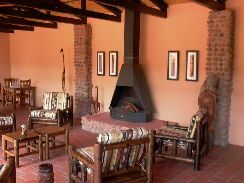 For individual treatment by the owners, Family Thiele, and enjoying farm-style accommodation is the place for you. If you prefer the outdoors and wish to camp in the wilderness Namtib offers the camp site providing basic ablution and cooking facilities. Whether you're looking for an en-route stop-over or a place to spend a few days to find true relaxation - Farm Namtib is your ideal destination! 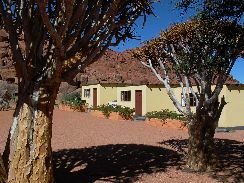 Namtib Desert Lodge provides typical farm style accommodation in five separate bungalows, each with an own bathroom. The owners, Family Thiele, attend personally to the guests and provide interesting information about life at the edge of the Namib Desert. Under German management.